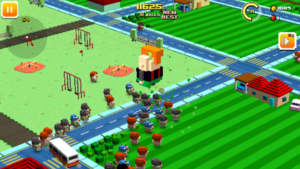 Zombie Bloxx Is A New Fun, Super Addictive Android Game By Big Blue Bubble. Do Whatever You Can To Survive This Zombie-Filled Nightmare. Concept Of This Game Is Similar To Other Zombie Games[Kill Zombies] But Characters, Weapons, Graphics, Gameplay, Environment Is Totally Different. In This Game, Hordes Of Zombies Are Chasing You, You’re Alone, But Zombies Are Increasing. Your Goal Is To Survive As Long As You Can, Kill Zombies With Special Weapons, And Try To Keep Away From Yours. Environments/Locations Generates Randomly. Everytime You Start The Game, You See Different Location. First Thing You Have To Do Is Avoid Zombies, Search For Power-Ups, And Weapons. Each Character Of This Game Comes With Special Weapon And Vehicle[Some] Like Police Car, Gun, Football, Unicorn, Dragon, Ninja Blade, And More. 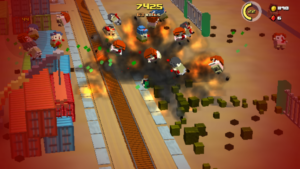 Weapons Help You To Kill Zombies, Power-Ups Helps You To Move Fast And Increase Duration. You Can Also Get Rid Of Those Stupid Zombies With The Help Of Trains, Vehicle[Running On Road], Crane, And More Depending On The Location. From Knives And Clubs To Tanks And Crushing Trains – You Have Everything To Keep Away From Wave Of Zombies. To Unlock And Upgrade Your Characters Coins Are Required Which You Can Get By Playing Game Or By Achieving High Score. Graphics Of The Game Are Excellent, Gameplay Is Too Good. 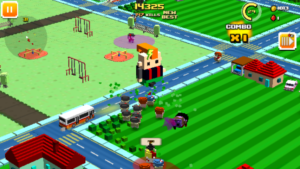 Overall Zombie Bloxx Is A Great Fun Super Addictive Game. You Should Play It[Its Offline, Free, Entertaining, And Time Killer]. Size – 60 MB, Price – Free. Download – Here[Google Play Store]. Next Post:23 Best Video Editor Apps For Android To Edit Video Like A Pro!